I’m on Brighton Pier in the half term holidays. The skies are white with low cloud and there’s a sea mist blowing in but it’s warm enough to be outside so I’m sitting at one of the tucked away tables by Horatio’s Bar. Their playlist is quiet enough to ignore as are the distant screams of children as they hurtle through the air on the twirling aeroplanes of the nearest ride. My youngest and his friend are finally old enough to go on rides on their own so I’ve got them all areas wristbands and have settled down for a couple of hours of writing. Brighton Pier has a lot of memories for me. I came here as a kid then brought my kids and since I started writing it has always inspired me and often features as a setting in my work. It’s a haven for detail; competing, smells, sounds, lights, people of all types from babies in prams to pensioners with walking sticks, smiling children hopped up on sugar, hungover stags and hens, parents, grandparents, teenagers trying to be cool. I had a little walk around the hidden bits, the alleyways between the rides, the end behind the Turbo, because that’s what I did when I was writing my first book, Starlings. I’m feeling nostalgic. Starlings is entirely set in Brighton. 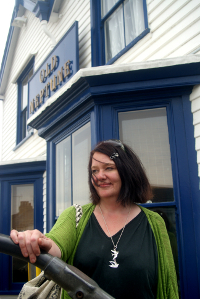 I wrote it when I first moved here and it helped me get a handle on my new home, I wanted to really get into the nitty gritty of the lesser-seen aspects of a British seaside town, to explore it as I would a character. Brighton has a personality that changes day to day, very different in the height of summer to a rainy day in December. I spent a lot of time seeking out the more unusual locations or looking at the well-known ones from a different angle. One of my proudest moments was at an event when a Brightonian reader exclaimed surprise that I wasn’t born and bred because I’d got it spot on. The reason for all this nostalgia is that Starlings will very shortly be out of print. I bought the remainder paperbacks from my publisher and I’ll be getting all the rights back very soon. This makes me both sad and hopeful. 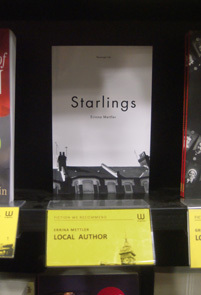 Starlings was my first book and I had no idea what had to be done to market it to readers. For me it was a huge achievement that it was published at all but I’ve always thought it didn’t live up to its full potential. I’d like to give it a re-edit and a cover make-over. I have plans to publish a new edition paperback and release it on ebook and I know a lot more about publishing now than I did then. It’s seven years since it came out, my publisher, Revenge Ink, was a gutsy little maverick trying to showcase the type of books being ignored by the mainstream (if anything this situation has got worse and the industry has got more blinkered in what it chooses to publish). I am forever grateful to Revenge Ink for trying, for taking on my little book because they really understood and believed in it and we part on very good terms. People still buy Starlings, they come up to me at readings and say they’ve just discovered it and ask why I was so mean to Barney. I’m asked to local book groups on a regular basis and it’s still in the Brighton books section of the city’s bookstores. I’ll be peddling the ‘limited edition’ originals at book fairs and market stalls until I run out (or hell freezes over). If you want a signed copy, personally dedicated by the author email me at erinnamettler@gmail.com or look out for me at car boot sales, a copy is yours at the knockdown price of £5 plus p & p.
Now we’re off for fish n chips. 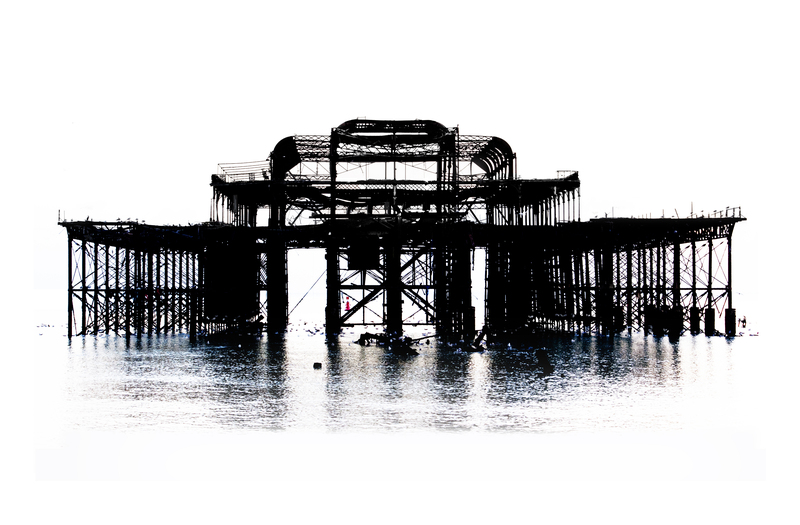 The West Pier is dying. Last Wednesday a huge chunk of her fell into the sea, dislodged by heavy winds and swelling tides. Now there is a gap on the Eastern side of her and the middle hangs precariously over pirana waves. Brighton’s residents gasped collectively and wailed about her not lasting the next twenty-four hours, many braved the wind to gaze on her last moments. The wind raged through the night but the Pier stood defiant. She won’t last the weekend, they said. Tomorrow a week will have passed but tomorrow the weather forecast is gales and high swells. The West Pier features in the first proper short story I ever wrote, a story which went on to form the first ‘chapter’ of my episodic novel, Starlings. For me the landmark is the most beautiful place in the city. She is definitely female and also old. I don’t mean in terms of actual years, I mean anthropomorphically. She is, to me, an old lady. She was once a great beauty, immaculately dressed, popular at parties, blessed of many lovers but then she aged and she couldn’t afford the fine clothes and shiny jewellery the younger girls had and her looks began to fade, people didn’t come calling anymore. 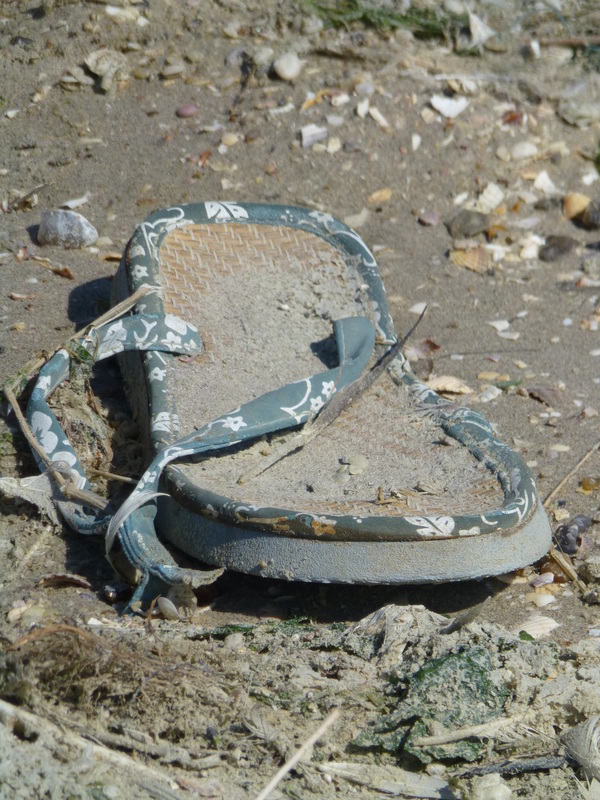 She still paddled in the sea, as she had in her youth, but she grew thin through lack of sustenance and good company and her legs withered, the bones showing through. Then there was the fire. I remember visiting Brighton in the 1980s and 90s and seeing her listing downwards, her paint peeling and windows broken and I remember thinking how romantic it was that she wasn’t a naff bells and whistles fun-fare like the Palace Pier. Every seaside town had a pier. I’m from the North, you couldn’t really beat Blackpool for seaside attractions, but Brighton had the West Pier, decaying, abandoned, loved only by the birds. It was special. The white picket fence brigade hated her then, she was an eyesore, a blight on their beautiful city, someone should do something about her. But whenever I came here she was the thing I wanted to see the most. She was Miss Havisham. She appealed to my introverted younger self. I wore black then, even in the sun, Wuthering Heights was my favourite book, the Mary Chain played in a loop in my head and I wouldn’t have been caught dead swimming in the sea. What better than a pier you weren’t allowed on because it wasn’t safe! I didn’t want a kiss-me-quick hat and a stick of rock; I wanted to gaze on decay. I’ve changed, I hope, I like nothing better than a sea swim these days, but I’m still drawn to the desolate beauty of West Pier. I thought she was at her most beautiful after the fire. I didn’t move to Brighton until 2003 so I wasn’t here for the fire but afterwards she seemed elevated into a new art form, something truly unique. Her burnt out wreck has inspired me in so much of my writing, even when the work isn’t actually about her, the image of her guides my hand, churning up thoughts of lost beauty and aged stoicism. She is memory personified. She is death. She is anything you want her to be. Brighton will be a much less interesting place without her. There won’t be the collective thrill of walking around her ruin at extremely low tide or watching the waves crash over her prow in stormy seas. I won’t be able to hear the peculiar metallic ting of the wind shaking her strutts or see clouds of starlings crowd her at sunset. If I’m honest though I’m really looking forward to seeing her fall. To me she is a reminder of our mortality, that technology is meaningless and that all things eventually come to an end. How much sweeter it is to be here when she goes? To be able to say ‘I was there when…’ This is selfish of me I know, but I don’t want her rebuilt like she was, because then she’d just be another pier and in the end she’s so much more than that. If you are not as selfish as me and you would like to see a life size sculpture of the West Pier on the front when she goes then please sign this petition (anything is better than a stupid tower). For review copies of Fifteen Minutes, details about mentoring and anything else – erinnamettler@gmail.com. Starlings has been long listed for the 2012 Edge Hill University Short Story Prize in a year with a record number of entries, sharing company with entries from Edna O'Brien, Hanan Al-Shaykh and Robert Minhinnick. 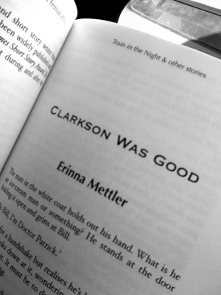 CLARKSON WAS GOOD published in THE TRAIN IN THE NIGHT AND OTHER STORIES published by Completely Novel in 2010.